Hi All, I photographed a "Wild" cat in Cambridge this week. Has anyone got any idea as to what it is? We discussed this in detail with Terry on the chat session. General opinion was that it had unusual markings - prominent spotting on mid and hind bopdy with stripes on legs and tail, and fewer markings on neck. Probably an unusually domestic, although I can't identify the breed, if any. 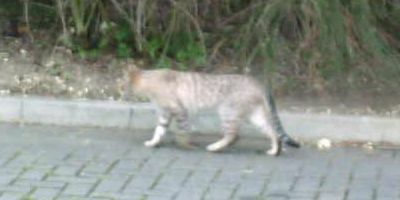 The images of the cat strolling down the pavement, to me, looks like an ordinary domestic tabby...if it's a Bengal it wouldn't be considered a very good one! Isidore mentions "a Mau ( the only domestic spotted cat without wild cat blood )"
All domestic cats are descended from wildcats of various forms...even the Mau. It's thought all the different breeds have been influenced by whatever the local wildcat was, be it a European wildcat, African, Asian, Sand Cat etc. 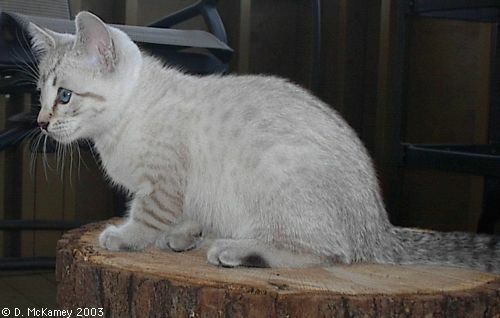 It's because all domestics have essentially wild blood that it is so difficult to tell a big tabby cat from a wildcat, and the reason that the original wildcat markings, such as the tabby striping and 'M' forehead markings are so common in the most domestic looking cats...the natural wild blueprint is so strong. 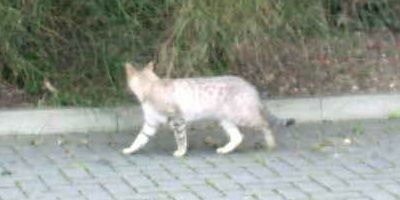 Do you think it could be a hybrid of somesort.it definitely has unusual markings for a domestic cat. Has photographer seen it since? He should have followed it. I have a kitten that looks like this cat. The cat in your photo looks a lot like my kittens dad. 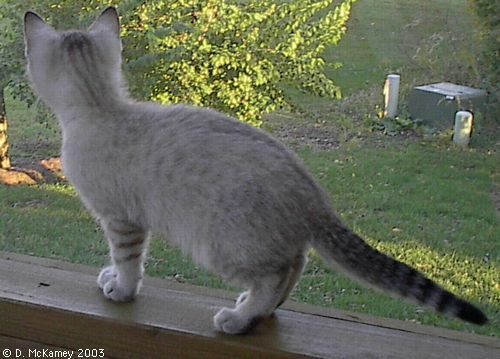 I have attached a couple of photos of my kitten so you can see. My kitten is a snow lynx Bengal.